Have you ever felt like your tween/teen daughter’s emotions are “too big” for her? Do seemingly small problems send her reeling and off track? Does it seem like she’s constantly on the verge of shouting, crying, or shutting down? As frustrating as this is for you as a parent, it’s just as frustrating for your daughter. That’s the bad news. The good news is that it’s normal behavior, but that doesn’t mean it can’t be better for you and your tween/teen. That is where MissHeard Media, a media and live events company that empowers girls to be savvy, smart, and global, comes in. 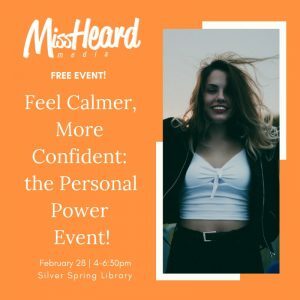 Register your daughter for the FREE MissHeard Media event on 2/28 at the Silver Spring Library from 4:00-6:30 pm that teaches tween and teen girls to manage those difficult and challenging emotions and harness their unique power. In the 2.5-hour event, your daughter will learn life skills that will help make both of your lives calmer, easier, and better! After the event, she’ll feel more confident and prepared to handle whatever comes her way, giving her the boost she needs at home, at school, and anywhere else she goes. Be able to regulate difficult emotions. Instead of “blowing up,” they learn to employ coping and calming strategies. 2. Explore building flexibility, self-efficacy, and peer problem solving skills. 3. Build a personalized plan to manage their own unique challenges and personal strengths, and create a positive mantra for managing challenging situations. 5. Celebrating her new skills! This event is completely FREE, so space is extremely limited. Are you ready for your daughter to be calm, cool, and confident, even in the face of challenges?